Greentech Biofuels is proud to announce the latest Nelson Mandela Bay business that has committed to reducing their carbon emissions and the effects of global warming. 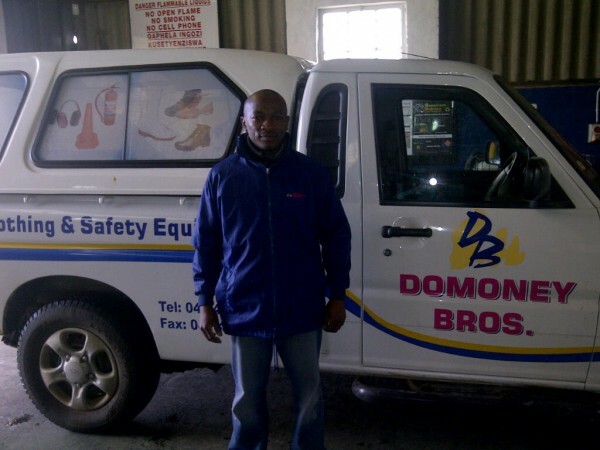 Domoney Brothers, suppliers of protective clothing and safety equipment, have chosen to fuel their delivery vehicle on eco-friendly biodiesel produced from waste vegetable oil. Catch them driving around the bay, you might be left feeling a little bit hungry. Submitted by: Hayden Hill of Greentech Biofuels. Vakele from Domoney Brothers filling up with biodiesel at Greentech Biofuels. Click here to see more PE Movers and Shakers. Click here to submit your or your company achievements.